Celebrate fall with Haddonfield’s Fall Festival and Juried Craft Show on Saturday, Oct. 15 from 10 a.m. to 5 p.m. Rain date for the Fall Festival and Craft Show is Sunday, Oct. 16 from noon to 5 p.m. The day-long Fall Festival will feature a variety of Haddonfield’s community groups, who will be lined up along Kings Highway between Haddon Avenue and the PATCO speedline. Community groups will be on hand to educate and inform attendees about their specific organization and their list of activities. The Haddonfield Farmers Market will also be open on Kings Highway between Haddon Avenue and Borough Hall for all to enjoy. More than 100 crafters offering seasonal items and decor, pottery, clothing, glassware and other handcrafted wares will set up various artisan tents along Tanner Street, which will be closed to vehicular traffic during the festival. A DJ will be performing on Tanner Street as well as the band Lonesome Turnpike Ramblers in the Gazebo at Kings Court from 1 p.m. to 4 p.m. The Haddonfield Pick Up band will also be playing in front of Grace Church in Haddonfield, located at 19 Kings Highway East at 11 a.m.
Back again this year is scarecrow making presented by the Junior Women’s Club of Haddon Fortnightly, located in Kings Court. During the event, there will also be a Ribbon Cutting ceremony at the new Curvy Girl Consignments, located at 221 A Kings Highway East, at noon. Garaguso’s Classical Martial Arts will have a demonstration in front of the Kings Court Gazebo at noon. Horse-drawn carriage rides will begin and end at Kings Court from noon to 3 p.m. to add to the festive flair. 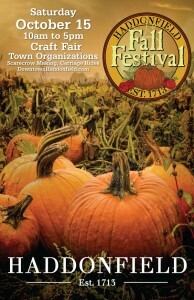 For more information about Haddonfield’s Fall Festival and Craft Show, please visit DowntownHaddonfield.com.